Outside of wrestling, another of my hobbies is reading. Sci-fi and fantasy are my go-to for when it comes to diving deep into a good yarn. Despite these preferred genres, comic books are a form of entertainment I never really took to. So when the team of Suspicious Behaviour Productions came to me with the chance to read the first two issues of their comic about professional wrestling, I accepted with an open mind. I can say without hesitation that I’m glad I took this project on. “Invasion From Planet Wrestletopia” is a story revolving around “Rock & Roll” Rory Landell, a down on his luck wrestler, who goes into business for himself by way of a shoot promo. After learning that the American Wrestling Federation’s (AWF) booker won’t be making him World Champion as promised, Landell takes matters into his own hands by proclaiming himself the champion of the whole universe instead. This infamous promo is transmitted from TVs around America to a planet, light years away, called Wrestletopia. Upon hearing Landell’s bold claim to be the Universe’s champion, Wrestletopia overlord and self-proclaimed GOAT, Manifest Destiny declares war on Landell and his fellow earthlings. On the surface, the story is a clashing of two frequently used tropes in fiction: alien invasion meets quasi-famous star hitting rock bottom (no pun intended). However, that description alone fails to tell you that this is also a love letter to wrestling, its history, and its many “carnie” quirks. Take, for instance, the many nods to things only found in the world of pro wrestling. Referring to everyone as “brother”. Long winded signature promos that Ric Flair himself would proud of. An homage to the legendary Family is made also, with an actual wrestling bear being used by a small town territory. The comic series’ creators take things further with comical pot shots at WWE itself. Rory Landell’s manager, a Hawaiian in origin, plays the stereotypical role of a Chinese heel fortune teller. Certain booking decisions are changed last minute due to trends in PPV buy rates which, in turn, instill in the booker a desire to offer their audience a more family-friendly product. Sound familiar? I’m sure it does. Nevertheless the humor is dry enough that the writers’ poaching of ideas from wrestling lore had me laughing out loud rather than rolling my eyes. In this regard, Edward Kuehnel and Matt Entin have done a fantastic job. Illustrator, Dan Schkade has joined in on the fun callbacks also, with wrestlers having just enough likeness to remind you of the likes of the Razor Ramons and Macho Man Randy Savages of the world, among others. There’s no denying that this story gets ridiculous, and quickly. But with all the above positives, it’s easy to embrace the farce for what it is: a tribute to professional wrestling and the B-movie alien invasion genre which, if we’re being honest with ourselves, are already farcical enough as it is. 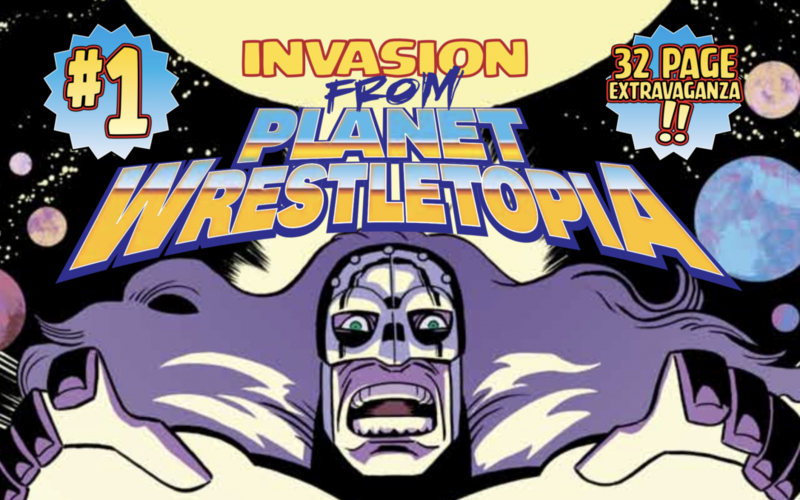 “Invasion from Planet Wrestletopia” is a must for wrestling fans who like to peek behind the curtain into the downright wacky world of wrestling. Like I said at the start, I’m not a massive comic mark. But I’ll be keeping an eye out for future releases. You can find more information on the series at the Suspicious Behaviour Productions website. Written by “205 Clive”, author of the 205 Live reviews for Social Suplex, and one half of “The Ricky & Clive Wrestling Show” on the Social Suplex Podcast Network.